During our first season with the United Shore Professional Baseball League (USPBL), one of our primary goals was to establish a culture of health and awareness as it relates to the throwing arm. However, this isn’t something that just happens. As a pitcher’s health is largely dictated upon mechanics and a well functioning muscular system to name a few, we needed players to buy in and adapt to The DVS System. The System was designed to promote efficiency in all aspects of a pitcher’s game, and efficiency is arguably the key ingredient when it comes to health and performance. Thus, in order to generate a clean injury record among all pitchers within the league (which we did by the way), we educated players with the proper information and gave them the tools necessary to sustain health and optimize their body. This process not only produced the results we were looking for, but it equipped each player with awareness, a trait that is essential within a current culture polluted with misguided and contraindicated training programs, modalities, and philosophies. One component in particular that we spent a lot time on throughout the course of the season was Shoulder Range-of-Motion (ROM), and how it relates to overall arm health. For those that need a review on the importance of ROM within this population, ROM: A Pitcher’s Best Friend…or Not and ROM: The Fundamental Truth Part 1 and Part 2 would be good to reference. It was so important in fact that we took about 2,200 total measurements when it was all said and done. This frequency of collection not only created a valuable opportunity to educate and give players an awareness of what was actually going on underneath the skin, but it allowed us to increase our data sample size to further validate the DVS System. Birmingham Beavers pitchers performing the Essential Arm Care Isometrics prior to their throwing program. Outlined below is the entire Case Study, along with a complete summary of all data that was collected from over 50 professional pitchers throughout the course of a season. Our hypothesis was that as pitchers spent more time exposed to the DVS Arm Care System, the USPBL Throwing Program, and our pitching methodology that is designed to improve a DVS Score, their Shoulder ROM Patterns would become less injurious. Measurements from approximately 51 pitchers were taken on each shoulder several days per week. All measurements were conducted prior to any activity to ensure a resting state, and to establish consistency. Each pitcher was assessed on game days multiple times per week, with some pitchers coming back the days following an outing to capture the after-effects of throwing. Passive ROM measurements were recorded using a digital inclinometer for shoulder Total Arc Motion (TAM), Internal Rotation (IR), and External Rotation (ER) on both the throwing and non-throwing arms. For each shoulder, the limb was moved passively in each direction until maximal motion occurred. In order to ensure each shoulder achieved its full range of motion, the examiner used a combination of capsular end-feel and visualization of compensatory movement. The humeral head was not stabilized in order to allow for natural shoulder motion to occur. For each measurement of internal rotation and external rotation, the scapula was securely stabilized on the table. All measurements were taken at rest prior to any throwing. On average, Total Arc Motion (TAM) within the Dominant-Arm (DTAM) prior to DVS System implementation was 149.8º, compared to 156.3º post. Typically, as stress begins to accumulate throughout the course of a season, it’s common for pitchers to lose ROM in their throwing arm. This is likely due to the fact that the body begins to tighten as joints become more unstable. However, this is contrary to the trend we observed. 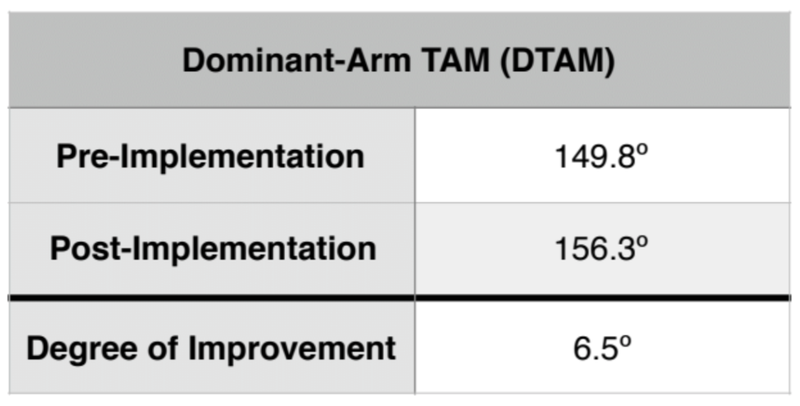 Another trend we observed dealt with Dominant-Arm TAM Difference (DTAM DIFF), which is the TAM Difference between the throwing arm and non-throwing arm. Prior to the DVS System, the average DTAM DIFF among all pitchers was -2.4, meaning the throwing arm was limited by more than 2º on average relative to the non-throwing arm. However, post DVS System implementation, the average DTAM DIFF jumped to 2.58º. This is roughy a 4º swing in a positive, less injurious direction. Much like DTAM, this pattern found in DTAM DIFF is counter to what is commonly seen in this population. As the rigors and stress associated with a typical professional season take their toll, the throwing arm will commonly become limited relative to the non-throwing arm. This deficit, when it gets to a certain point, is considered by many to be one of the best predictors of a future throwing related injury. With that said, this group seemed to handle stress better than the average, as their throwing arms seemingly became healthier as the season progressed. One of the more underestimated and overlooked concepts in sports is “the number one ability of an athlete is availability.” Perhaps this gets put on the back burner because most athletes and coaches are under the impression that you have to sacrifice health to achieve high performance, or that injuries are just part of the game. However, as we outlined in The DVS Score, Part 1: A Pitcher’s First and Largest Step Towards Success, you will see that health, along with mechanics, are actually the two influenceable components that relate most to velocity and success. Thus, by focusing on health and making your body move more efficiently, not only will you find your performance ceiling, but you decrease your chances of landing on the DL. This is why these numbers above are so significant, and a large reason why we spent so much time educating players on the importance of ROM. When health is high and the body is thriving, the Central Nervous System will allow full ROM. However, when health is low and the body is protecting against itself, it will not only restrict ROM, but performance will decline as well. Therefore, these ROM measurements are essentially a Check-Engine Light to ensure the body is functioning at a high level. The DVS System essentially manages this delicate balance of health and stress through efficiency. It adds variables to a pitcher’s routine that have a large impact with minimal associated risk, and excludes things that have minimal impact, but carry a lot of unnecessary stress. Listed below are the three components of The DVS System that work together to optimize velocity and success while significantly reducing injury risk. Despite popular thought, throwing injuries in baseball are rarely a product of bad luck. Yes, individual circumstances and genetics certainly play a role, but neglect and ignorance are much more impactful. In 2016, the inaugural year of the USPBL, we proved this by not only keeping pitchers injury free, but through nearly 2,200 lines of ROM data that was evidence of healthy, less injurious ROM patterns. Not only that, pitchers on average improved velocity across the board as the season progressed, further substantiating the ideology that a pitcher doesn’t have to sacrifice health in order to achieve optimal performance…all they need is efficiency which can be found by implementation of The DVS System.